Stirling University Library now has access to the IEEE Xplore Digital Library until 29th November 2015, thanks to an excellent SHEDL deal (Scottish Higher Education Digital Library). IEEE Xplore Digital Library provides access to the IEEE/IET Electronic Library which features content from IEEE (Institute of Electrical and Electronics Engineers) as well as IET (Institution of Engineering and Technology). The full list of journal and proceedings titles will be added to the Library Catalogue during August. IEEE Xplore provides access to well-regarded and highly cited literature: IEEE’s scientific and technical articles fuel more new patents than any other publisher and are cited over 3 times more often. The database is updated daily with more than 20,000 new IEEE/IET articles added each month. Use IEEE Xplore to find journal articles, conference proceedings and standards in computer science, communications and electrical engineering. From the results’ pages you can link directly to PDF files (where we have access to the full-text), you can also download records into bibliographic management software, such as RefWorks and BibTeX. For example, see our brief guide on exporting records to RefWorks. One particularly useful feature, is that each record on the results page shows you how many times a paper has been cited. 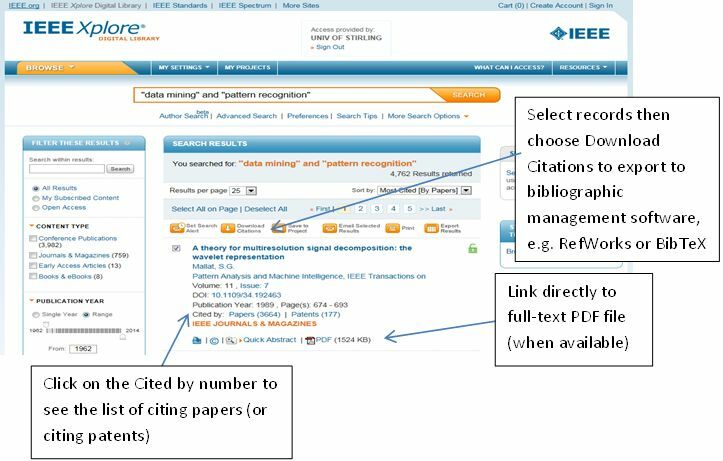 Then clicking on the Cited By number will pull up a list of all the citing papers. If you create your own Account on IEEE Xplore, you can then save searches to re-run at a later date and to receive alerts via email or RSS when new content is added matching your search criteria. You will need to Sign In to use these options. See more about signing in to IEEE to set up saved searches and alerts. To access IEEE Xplore: within the Portal, select the A-Z list of online resources link, then choose the letter I, then IEEE Xplore Digital Library from the alphabetical list. See our IEEEE Xplore guide at: http://libguides.stir.ac.uk/ieeexplore. See a list of tutorial videos at: http://ieeexplore.ieee.org/Xplorehelp/#/tools/toolsForAllUsers/tutorials.